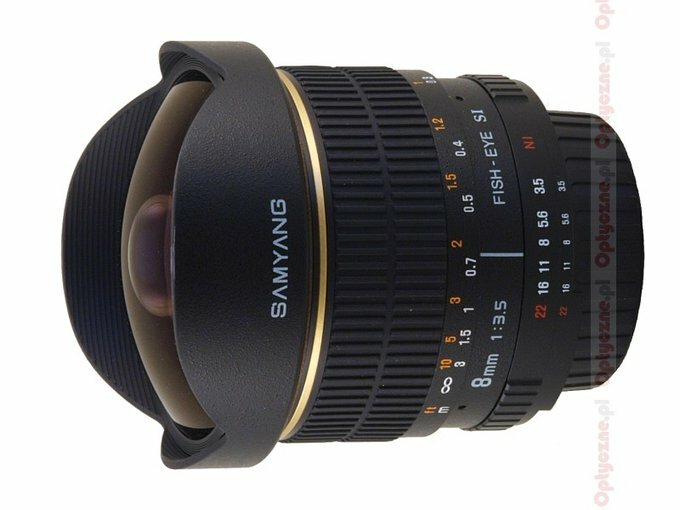 When the first piece of information concerning Samyang’s new fisheye lens came to light, the first thing I noticed was its focal length. Samyang had been announced as a diagonal fisheye with a focal length of 8 mm, giving us a field of view of 180 degrees on a DX sensor (1,5x crop factor). These parameters differ from its competitors’. For instance, Nikkor 10,5 mm and the recently released Sigma 2.8/10 mm both feature the field of view of 180 degrees on DX matrices. Whence the difference in millimeters? To explain it, we must go back to the basics. Namely, to the subject of projection types used in lenses. These have no influence on the results of our review. 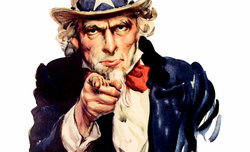 Those who don’t like formulae, science and mathematics can, in all conscience, omit them and proceed to the next part. The others are welcome to read further. The standard projection formula used in most lenses is called rectilinear projection and it aims at the correction of distortion. In case of this particular projection, straight lines are to remain straight, even for wide angles of vision. But there’s no such thing as a free lunch. A lens like this, having a focal length of 10 mm, has a field of view of only 110 degrees, which is far from a fisheye’s 180. 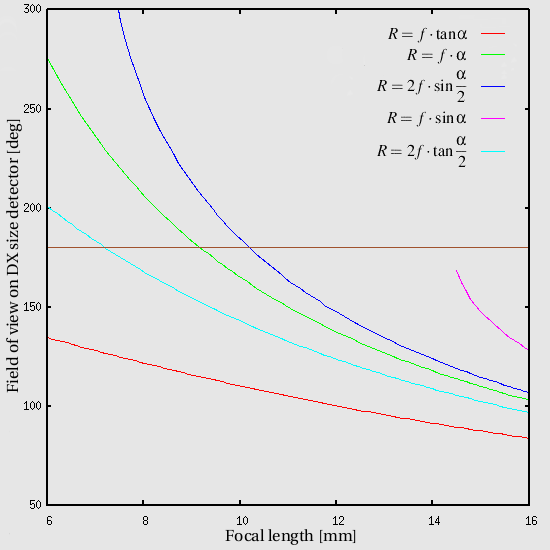 The relation between a lens’ field of view and its focal length for rectilinear projection is represented by the red line in the picture below. We can, however, acquire a wider field of view for a similar focal length, the price of which is distortion. In relation to the projection used, geometrical distortions may differ in character and the field of view – focal length relation can assume various forms. And so, in our picture, we have to do with the following projection formulae: drawn in green is the projection maintaining angular distances (called equidistant projection ), the projection shown in blue maintains surface relations, another one (called orthographic projection and marked pink) maintains planar illuminance, the last one (stereographic projection, shown in turquoise) maintains the angles. For better orientation, the value of 180 degrees is shown by the brown, horizontal line. Clearly, Nikkor 10,5 mm perfectly fits the blue curve. Sigma 10 mm seems to be an example of equidistant projection. The combination of 8 mm and 180 degrees used in Samyang implies the use of stereographic projection. It is very interesting news. Using such projection in photography results in the most eye-pleasing effects as in the corners of the frame, shapes remain the least deformed and the bending of straight lines is moderate for a fisheye. The problem with stereographic lenses is the difficulty of their making, which usually triggers high prices. 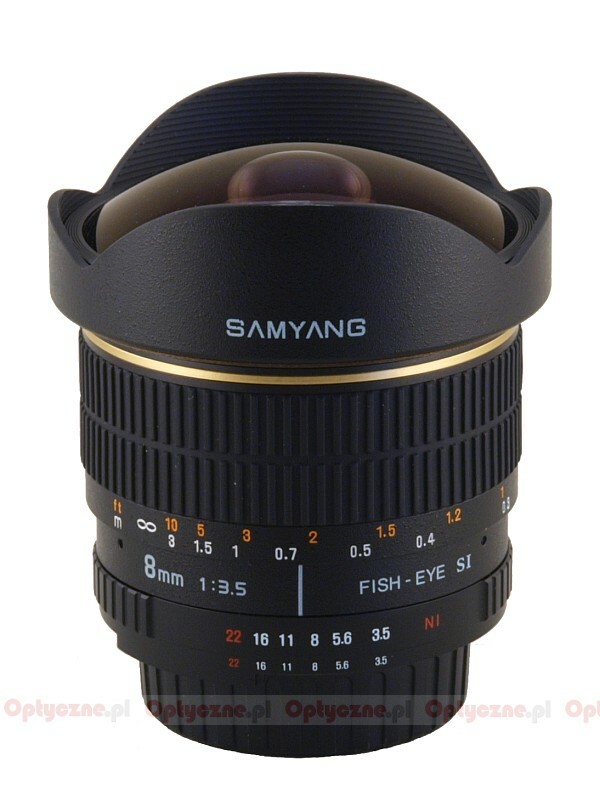 To our complete surprise, the stereographic fisheye is offered by no one else but the cheap Samyang! 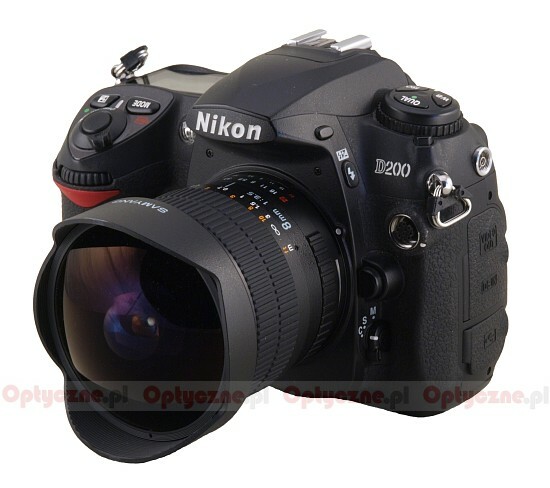 The lens was lent by the e-shop Foto-Tip for the needs of this review. The company warns that we have to do with a pre-production lens. The manufacturer, however, plans to make no changes in the instrument’s final shape. After all, we have to do with a fully manual lens so there’s no electronics or firmware to update. The optical structure, on the other hand, is to remain unaltered. You’re welcome to learn more about our test procedure described in the article "How do we test the lenses?" Strona wygenerowana w 0.061 sek.